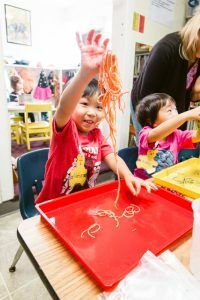 The preschool environment is designed for children to engage with various materials to stimulate and promote faster learning; social, emotional, cognitive, literacy language as well as their physical development. The foundation of all learning within the program starts with the building of positive relationships. 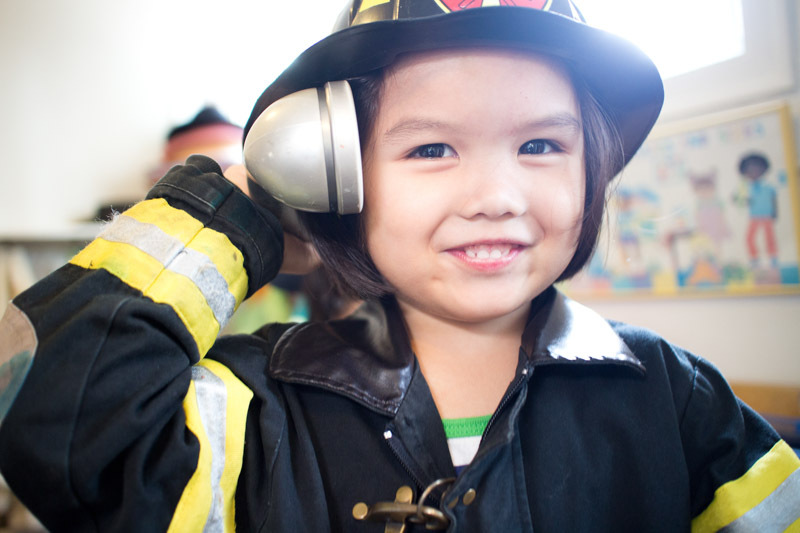 The uniqueness of the program is its emphasis on parent education and the Director working collaboratively with parents to provide children with experiences that will foster a love for learning and equip them with skills to be successful in TK / Kindergarten. The emphasis of the front room is imaginary play. Singing, music making, dancing and role-playing take place here as part of the daily routine. 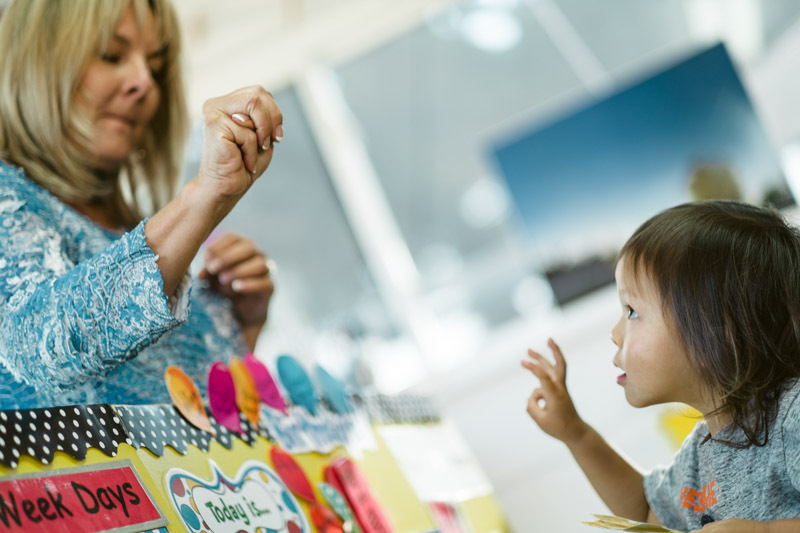 Activity boxes are available in this room such as pretend camping, restaurant, grocery store, dinosaurs, rocket ship, pirate ship, fashion show, trains and hospital. The child of the working parent in the front room may help decide the day’s activity. Puzzles or manipulatives may also be put out in the table in this area. Projects: Food preparation and art projects take place in this room. 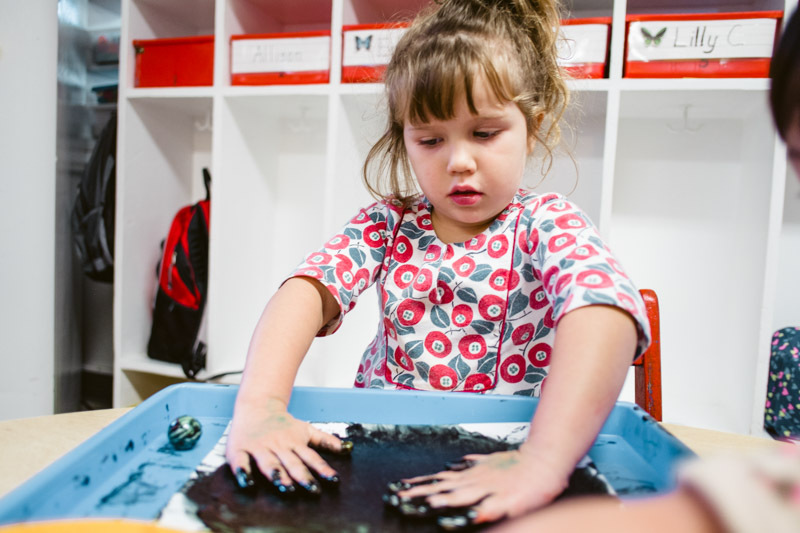 The kitchen offers a variety of art mediums to help strengthen small muscle and hand-eye coordination: clay, play dough, kinetic sand, scissors, glue and various textured medium. 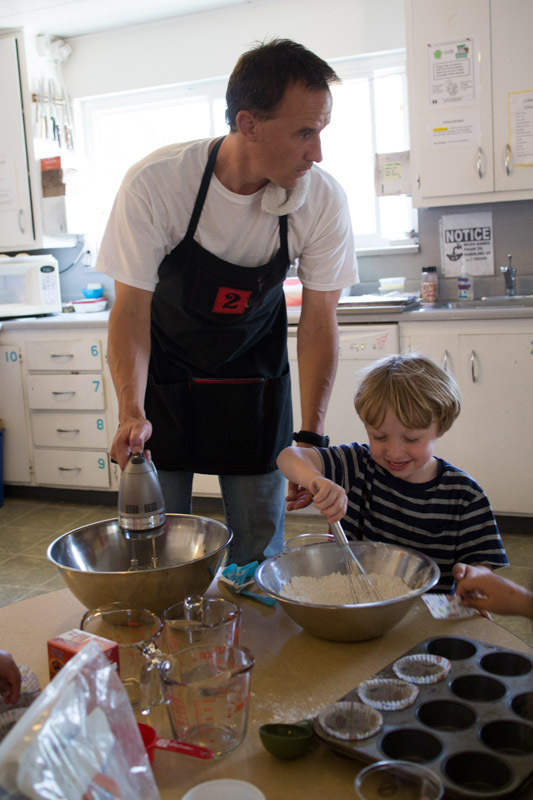 Snack: The parent responsible for the kitchen also prepares a nutritious snack for all the children. The snack consists of a protein source, a carbohydrate and a fruit or vegetable. Multicultural snacks are common here and the children get a fabulous exposure to many different types of healthy foods. Allergies/Special Diets: There are pictures and detailed descriptions of the children with food allergies and special dietary requirements. The school is a “NO NUTS” zone. Multiple precautions are taken to double check food trays (by 3 adults) before putting food in front of children. 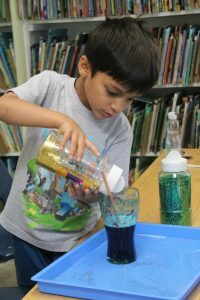 Science Room: In the science room, parents are encouraged to prepare and present simple science experiments to heighten the children’s interest and exposure to science. 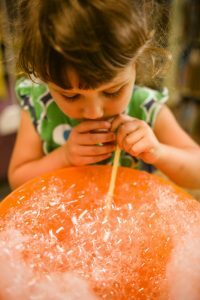 Children enjoy experiments in static electricity, water density, color explosions, fossil identification, animal care, puzzles, pattern recognition, insect biology and sorting. 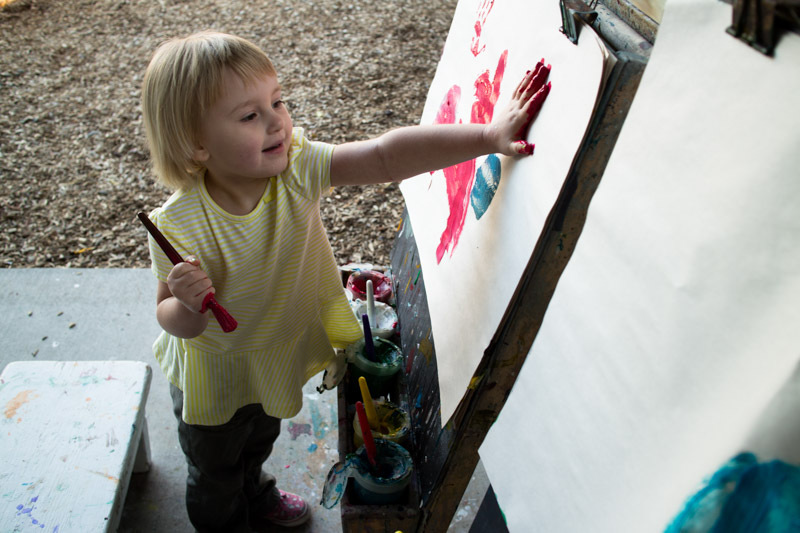 A writing/art center is available for children to practice fine motor skills, creative drawing/writing and art. 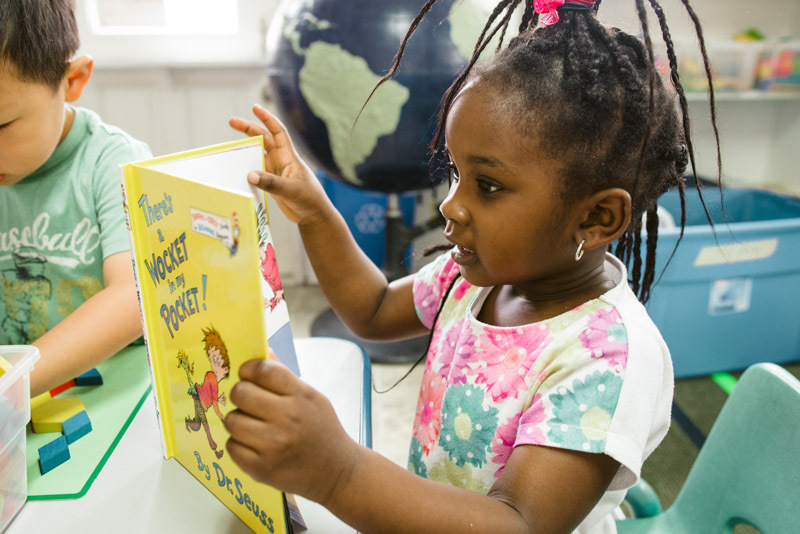 Library: This room is also the school library which contains hundreds of books for the children to enjoy. Family Living Area: The Family Living Area (FLA) provides children with an opportunity to use their imagination to role play family life and living within the environments (loft, kitchen, crib, table, chairs, oven, refrigerator, freezer, etc.) 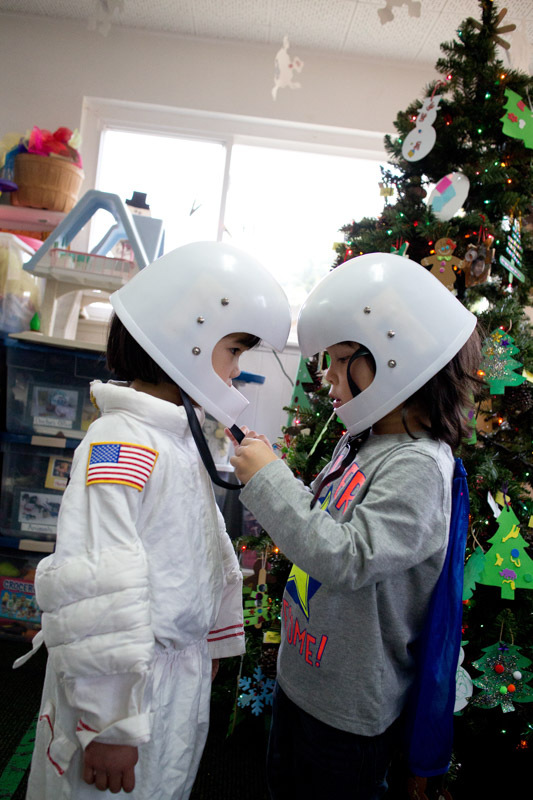 Children are able to transform themselves into their favorite heroes and heroines with dress-up clothes, shoes, hats, capes, and magic wands. The world of engagement and enchantment: the Backyard. 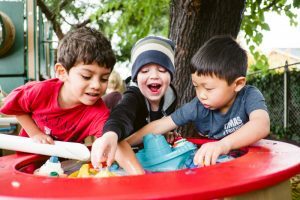 Warm or cold weather the water table provides opportunities for children to engage in various types of water play; color mixing, bubbles, boats, dinosaurs splashing, fishing, shaving cream floating, and more. 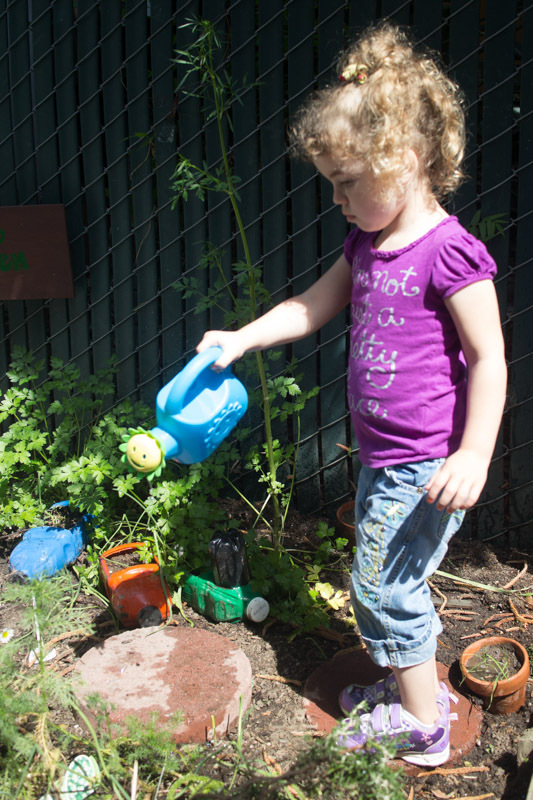 Children can pump water into a basin, spin the water wheel and watch water spill into water troughs and flow into water basins. 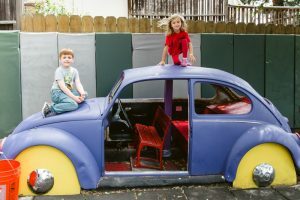 Driving peers to the ice cream store and far-off lands in our vintage VW Volkswagen is always an adventure. Grasping the trees rope swing and gliding out off the edge of the playground barrier and over the tan bark, or mastering sliding down the fireman’s pole brings delight and smiles to all. 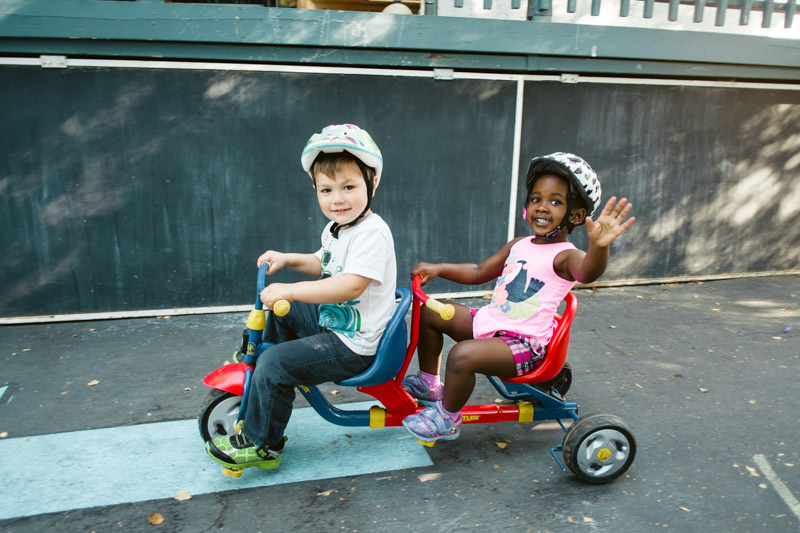 There are ample opportunities for developing large motor skills; riding tricycles, scooters, and balance bikes, digging, building, and mixing in our large sandbox using the sandbox excavator. 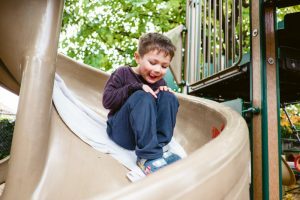 The front yard is equipped with swings, a stegal to climb on and slide down, a teeter totter, and stationary barrel saddles to ride away on. 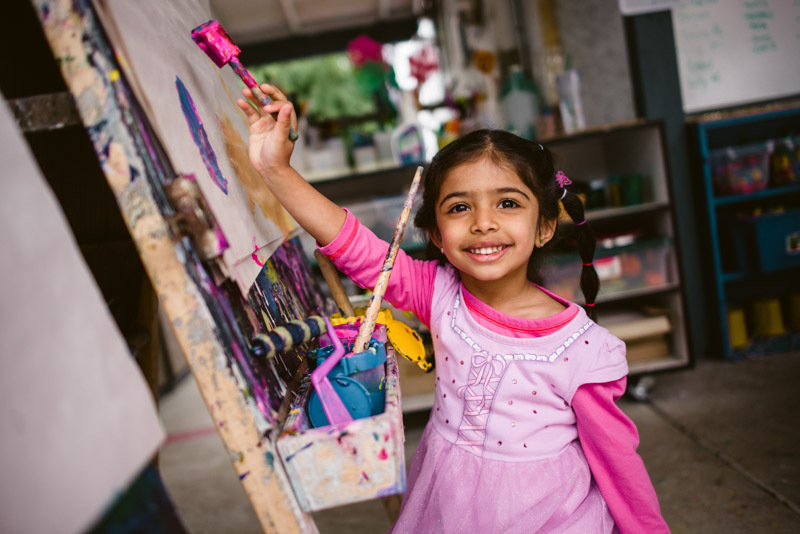 There are chalkboards for writing, a large plexi glass painting area, traditional painting easels and a host of objects to paint with: brushes, sponges, fly swatters, potato masher’s, feathers, Q-tips, and much more. Vegetable Garden: A small vegetable garden provides opportunities for all to learn about the life cycle of plants, caring for them, and eating the harvest. Children utilizing the garden water pump, repeatedly pumping, to fill watering cans to water the school plants. Tactile Table: The tactile table is filled with various textured items and manipulatives. Children create, build, and manipulate various materials within the table.